Practice fruit hygiene – Don’t leave ripe fruit on the tree or ground, including fruiting veggies like tomatoes. Be cautious about sharing fruit. Set fruit fly traps – Buy traps such as BioTraps from Bendigo Wholefoods, MacDonald’s Nursery (Bendigo) or Bunnings, or make your own. Place fruit into sealed plastic bags. Leave the bags in the sun for 5 -7 days to kill maggots, or boil or freeze. Put the bags into your garbage bin. Do not put affected fruit into your compost. Send an email to harcourtfruitfly@gmail.com with your name, address, phone number and photo if you can. 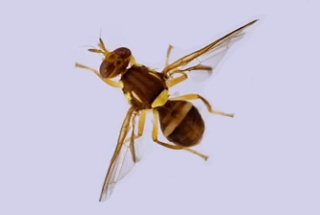 Queensland fruit fly (Bactrocera tryoni) is a significant horticultural pest that permanently inhabits parts of the Northern Territory, Queensland, New South Wales, and increasingly parts of Victoria. It attacks a wide range of host plants, decreasing production and making fruit inedible. This can have severe consequences for local and international trade. While Queensland fruit fly activity generally increases in spring as the weather gets warmer, it is not strictly tied to a particular season. If sufficiently warm weather persists into autumn or winter, fruit flies can continue to reproduce, if a suitable host fruit or fruiting vegetable is available. Traps are designed to lure and kill adult fruit flies. Some traps are used to monitor Queensland fruit fly numbers only, indicating if fruit flies are active in your area and when you need to act. These traps are often referred to as male-only traps. Other traps control Queensland fruit fly populations by catching females as well as males. If Queensland fruit flies are in your garden, you need to actively control these populations with a trap that can catch females as well as males. These fruit fly traps contain a protein which attract females then kills them. Follow the product instructions how set up and place the traps. Fruit fly traps are usually placed in host trees, but they can also be placed around the garden to draw fruit flies away from your produce.